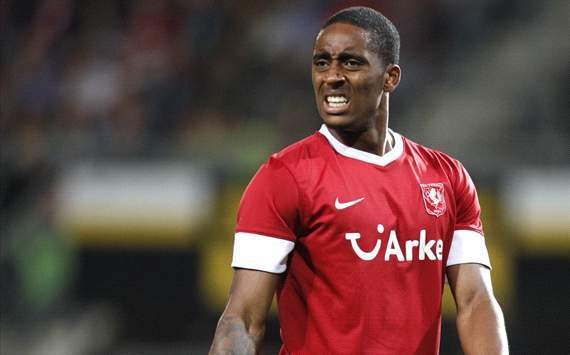 Leroy Fer is not a name that is synonymous with the fans of English football like that of Neymar, Edinson Cavani or Radamel Falcao but FC Twente’s defensive midfielder was the subject of a failed move to the Premier League during the January transfer window. Everton had agreed an £8.6 million deal with Twente but pulled out of the transfer at the last minute after the player failed a medical. Recent reports suggest The Toffees are still keeping an eye on the Dutchman, but who exactly is Leroy Fer and how would he fare in the Premier League? In one sense, Fer is a stereotypical example of any Dutch central midfielder; possessing fantastic vision and passing ability, as is expected of any player coming through Feyenoord FC’s Varkenoord youth academy. Confident on the ball, Fer played a number of positions at Feyenoord, including the role of second striker, hence the comparison with Marouane Fellaini in light of the transfer to Everton. However, he cemented his place in a defensive midfield role for Feyenoord before he moved to FC Twente in 2011 for a fee of €5.5 million at the tender age of 21. Under Steve McClaren at Twente, Fer became one of the brightest prospects for the future of Dutch football. A simple and consistent midfielder, he was a key player for Twente’s domestic campaign in the Eredivisie as they finished 6th in 2011/2012. After another promising season, speculation about his future was rife with links to suitors across Europe and most tellingly Everton’s fierce Merseyside rivals Liverpool. However, it was not just his passing and vision that caught the eye of scouts at Everton amongst other clubs. The Dutchman’s nickname slightly gives away his other attributes. The Bouncer’s defensive talents are very well noted, a physically strong player Fer also has a brilliant ability to break up play with his tackling, turning him into an all round midfielder and thus drawing comparisons with Patrick Vieira. Leroy himself has modelled his game on more modern players such as Yaya Toure and the similarities between the two are plainly obvious. Both Toure and Fer are very complete central midfielders, strong and imposing with and without the ball, but for fans of the Premier League the most exciting comparison is the similarities in their movement from midfield. Fer has become known for his penetrating runs from deep positions, reminiscent of Yaya Toure for Manchester City last season and he has given Twente an added goal threat during his time at the club. Fers history with a serious knee injury was the main stumbling block for Everton, so much so that David Moyes wanted to restructure the deal based on appearances. Everton allegedly requested to split the £8.6 million fee but the Dutch club couldn’t agree to these proposed changes and thus the transfer collapsed. The Toffees do not possess the spending power to improve their squad with several high profile signings each year and the Fer transfer was obviously too much of a risk for David Moyes. However, in recent weeks there have been rumours that Everton’s interest could be resurrected in the summer. The Everton scouts have been spotted at Twente’s most recent league games, keeping tabs on Fer. As I said at the beginning, the average English football fan is not likely to have heard Fer’s name before the January transfer window this season however football experts across the globe have monitored his progress since his emergence at Feyenoord. Fer was featured in the In Bed With Maradona 100 for 2012, an annual list of promising young players to watch for the year ahead. If it wasn’t for his injuries there is every chance Fer would have been even more impressive at club level and even on the international stage. There has even been a hint that current Oranje manager, Luis van Gaal would favour Fer over seasoned internationals such as Rafael Van der Vaart. Fer has emerged alongside a new generation of Dutch footballers who all promise a bright future for the nation. As some of the long established stars begin to reach the so called peak of their careers, a new contingent is rising in their wake. Players such as Adam Maher, Luuk de Jong, Jordy Clasie and Kevin Strootman have all been present in van Gaal’s recent squads as the Dutch side evolves under his stewardship. Fer is another, high quality option amongst a host of upcoming talent. Dutch football expert, Mo Moallim wrote a piece on Fer for the Mirror newspaper back in January as the transfer to Everton was close to a done deal. Mo believed that Fers style of play would suit the Premier League down to the ground but he may need to adapt quickly to the increased physicality of life in England’s top division if he is to succeed. Should the Dutchman sign for Everton in the summer, he would bring another physical presence to the Toffees midfield and relieve some of the pressure on Marouane Fellaini. That is, if the big Belgian doesn’t leave in the summer as is widely speculated. The Premier League would welcome another exciting player in the mould of Yaya Toure and at the age of 23, a move to England could allow Fer to develop into a key player for both club and country.